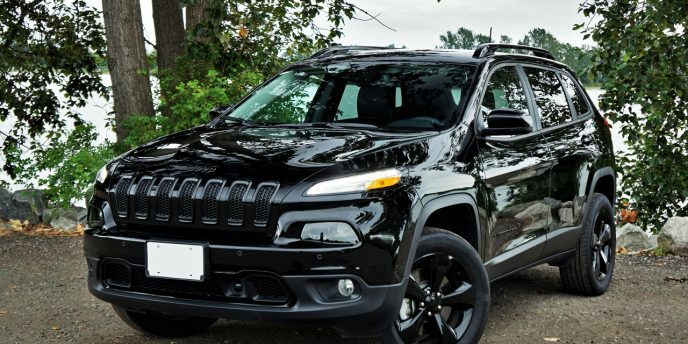 The fifth-generation Cherokee has always divided opinions, mostly due to its high-mounted headlamps and aerodynamically rounded seven-slot grille, so the new 2019 model, which is already starting to arrive in Canadian dealerships as we say goodbye to this outgoing model, repositions those headlamps downward for a more conventional look that should appease naysayers. I won’t spend any time discussing the new model, as there are still plenty of 2018 Cherokees left for savvy SUV buyers to negotiate great deals on, hence my review of this stunning all-black example before us. The Cherokee trim level you’re looking at is dubbed High Altitude 4×4, but Jeep could’ve just as easily swapped the word altitude for attitude. I can only speak for myself, but I think it looks fabulous, all of its bold blackness contrasting beautifully against white/orange and white/red lighting elements plus silver brake calipers. 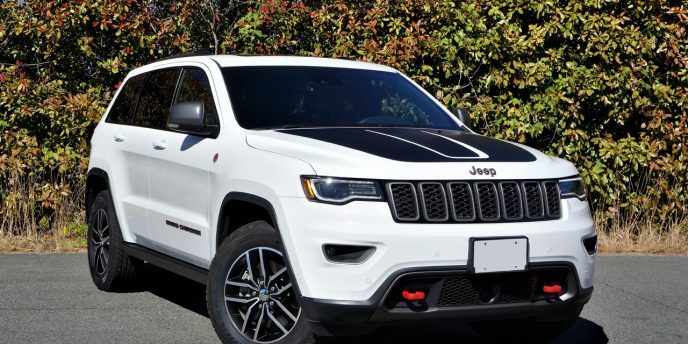 Truth be told, I’m not usually a black-on-black kind of person, preferring some shade of white or a tastefully bright colour, but I can’t deny the attraction, this Cherokee works. 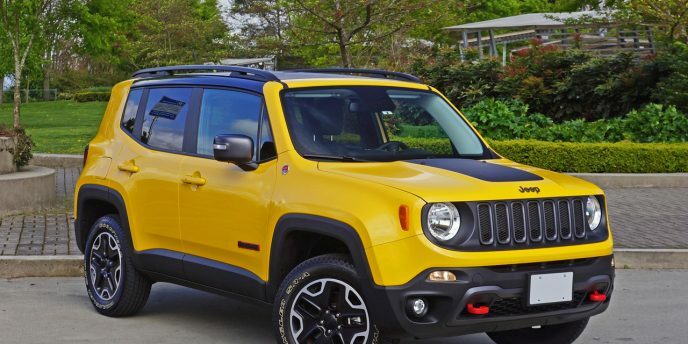 One of the great things about buying a Jeep is the brand’s incredible array of available colours, trim levels and special editions, making it so even the most eccentric of customers can find something that suits their unique personality. Conservative types will probably want to stick with the $27,945 base Cherokee Sport, $31,645 mid-range North, $35,145 premium-level Limited, or downright luxurious $40,645 Overland, while those hoping to pull eyeballs their way can purchase a less lofty $29,840 Altitude model, this $35,940 High Altitude, the $36,145 off-road focused Trailhawk, and finally the fancier $39,140 Trailhawk Leather Plus. Being a Jeep, Trail Rated 4×4 skills are mandatory, at least in upper trims. As it is, the Trailhawk models come standard with the brand’s Active Drive II all-terrain system, upgraded with Active Drive Lock, or rather a locking rear differential, whereas all other trims get standard front-wheel drive and the option of a lighter duty Active Drive I 4×4 system that only engages the rear wheels when necessary, or the more capable Active Drive II system without the locking rear diff. Jeep also provides choices in powertrains, including a 16-valve, DOHC 2.4-litre four-cylinder good for 184 horsepower and 171 lb-ft of torque, and a 24-valve, DOHC 3.2-litre V6 making 271 horsepower and 239 lb-ft of torque, with both joined up to a highly advanced nine-speed automatic transmission. As you can imagine the Cherokee’s fuel economy varies considerably depending on engine and drivetrain, with the most efficient four-cylinder, FWD models achieving a claimed 11.0 L/100km in the city, 7.8 on the highway and 9.6 combined, and the most potent V6-powered, 4WD-endowed versions good for an estimated 12.9 city, 9.9 highway and 11.6 combined. My Cherokee High Altitude 4×4 tester falls into the latter camp, as it shipped with the $2,845 V6 and Active Drive II all-terrain traction upgrade, boosting its price of entry to $40,985 before freight, fees and options. The move upmarket meant that an off-road suspension now supported road-ready 225/60 Continental ProContact all-seasons on 18-inch alloys, these not as go-anywhere-capable as the Firestone Destination A/Ts found on a previous Trailhawk tested a couple of years ago, but despite its very real 4×4 prowess the High Altitude model is probably more of a city slicker anyway. For instance, the Trailhawk’s alloys measure 17 inches due to their all-terrain tires needing taller sidewalls for better off-road capability, while along with its aforementioned Active Drive Lock system it gets a unique Selec-Terrain traction management system featuring a rock crawling mode. The High Altitude gets Selec-Terrain without Rock mode, its dial-selectable settings including Auto, Sport, Snow, and Sand/Mud, which no doubt would be good enough to get it back from the cottage after a torrential spring downfall or up to the ski hill mid-winter, let alone out from behind a piled up snowplow-supplied embankment. While all of this brawny ruggedness sounds exciting, what makes both of these 4WD-equipped Cherokees especially appealing is their overall refinement. This likely can be said of FWD versions as well, although Jeep has never supplied me with one of those for testing so I’ll have to take their word for it. As it is, all Cherokees I’ve tested, starting with a 2014 Limited V6 4×4, which was followed up by a 2015 Trailhawk V6 4×4, a 2016 North V6 4×4, and finally this 2018 High Altitude V6 4×4, have come as close to premium-level pampering as mainstream volume makers get. I’m not talking Range Rover territory, but certainly nearing Land Rover in soft touch synthetic surfacing and features. The higher end Jeeps were especially well finished for this compact SUV class, with padded stitched leatherette dash tops and stitched leather armrests, premium perforated leather seats, tasteful satin-silver (or in this High Altitude model’s case, satin-copper/pewter) inlays, chromed details, etcetera. The Cherokee has been a leader in electronic interfaces since inception too, with my tester featuring a large 7.0-inch feature-filled colour multi-information display between its highly legible white/red on black primary gauges, and a much more sizeable 8.4-inch infotainment touchscreen on the centre stack, this boasting very accurate navigation guidance and wonderfully detailed mapping, plus easy to use phone connectivity with Bluetooth audio streaming, a panel for controlling the dual-zone auto HVAC system despite having all the climate control hardware housed on a separate interface below the screen, an individual display for the heated (and cooled, if upgraded) seats and heatable steering wheel, plus more. You can leave your connected phone in a rubberized bin at the base of the centre stack and charge it via a USB port, while that same group of inputs includes the usual aux plug and 12-volt charger, plus an SD card slot. The High Altitude actually comes with a total of three 12-volt power outlets and three USB ports, plus a three-prong 115-volt household-style power outlet in back, while standard features not yet mentioned that are specific to this trim include bi-xenon HID headlamps, LED daytime running lamps, fog lamps, LED taillights, power-folding heated side mirrors with courtesy lamps and integrated turn signals, a leather-wrapped steering wheel and shift knob, ambient LED interior lighting, illuminated front cupholders, a storage bin on top of the dash, a universal garage door opener, voice activation, satellite radio, soft Nappa leather upholstery, a 12-way power driver’s seat with four-way powered lumbar adjustment (the Lexus NX only gives you two-way lumbar), heated front seats, a rear seat centre armrest with integrated cupholders, a cargo management system, a cargo cover and net, plus much more. My tester also featured a wonderful dual-pane panoramic sunroof overhead, capable of being opened for fresh air or completely covered by a power-retractable shade, this a $1,595 standalone extra, while other standalone options included $700 for navigation, and $450 for nine amplified speakers including a sub, which provided decent sound quality. My loaner’s packages included $1,295 for a Luxury group featuring two-way memory for the driver’s seat, side mirrors and radio, plus ventilated front seats, a powered liftgate, and more; a $995 Technology group featuring automatic high beams, adaptive cruise control with stop and go capability, advanced brake assist, forward collision warning with active auto braking, lane departure warning with lane keeping assist, semi-autonomous parallel and perpendicular parking assist, rain-sensing wipers, and more; while choosing the Technology group necessitates the $895 SafetyTec group that includes blindspot monitoring with rear cross-traffic detection and rear parking sensors with auto reverse braking; and lastly a $495 Trailer Tow group that added a 3.517 final drive ratio, heavy-duty engine cooling, a Class III hitch receiver, 4- and 7-pin wiring harness, an auxiliary transmission oil cooler, and a full-size spare tire. That’s $9,270 in options, upping the suggested retail price of my tester to $47,410 before freight and fees. Case in point, I had Toyota’s full-load RAV4 Platinum at my beck and call during the same week, and while it’s a very nice SUV with plenty of features it was nowhere near as fun to drive as this Cherokee. I’m sure to some reading right now that sounds odd, because the Cherokee is the only SUV in its class with 4×4 credentials, so one would justifiably think that its taller ride height and greater capability over rocks, gravel, sand, and what-have-you would make it less capable on a curving stretch of pavement, but strangely this couldn’t be further from the truth. 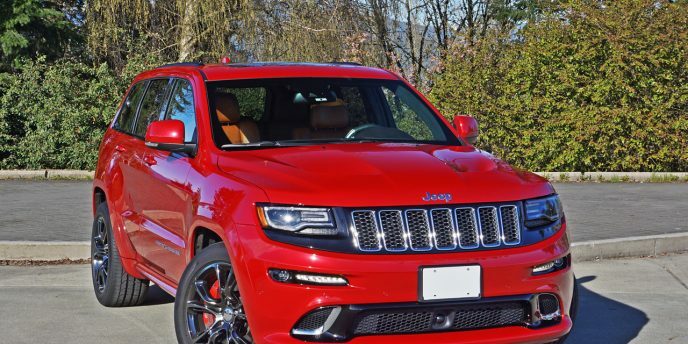 In reality, the Cherokee feels like the performance SUV, and the RAV4 a comparative laggard. When the 60/40-split seatbacks were folded flat via easily reachable clasps on the tops those seatbacks, expanding cargo space from 696 or 824 litres (24.6 or 29.1 cubic feet) depending on where the rear seats are positioned, to 1,554 litres (54.9 cubic feet), floor extensions fell into place to cover the gap where small items like wayward groceries (i.e. rolling apples and oranges) might otherwise fall. You can hang your grocery bags on cute little Jeep-branded hooks too, these clamped onto a useful organizer hoop attached to the left cargo wall. Also impressive, the aforementioned cargo cover retracts from within a very sturdy metal cross-member, and can be easily removed, while adding yet more functionality to this already impressively capable SUV, Jeep lets you drop the front seatback forward to stow really long cargo from front to back. If black isn’t your thing there are loads of other colours available, plus all those trim and powertrain options noted earlier, not to mention features left out of this review, so find the Cherokee that suits you best. Choices amongst 2018 models will be more limited, but getting a better deal might make compromising worth it. Either way I think you’ll be well served with a Jeep Cherokee. Have you ever driven a WWII-era U.S. military jeep? 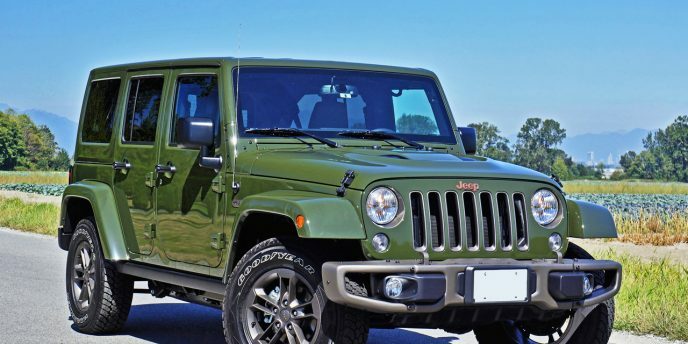 If yes you'll know the current JK-bodied Wrangler is more akin to driving a luxury car of the same era than the ultimately remedial Bantam BRC-40, Ford GP, and Willys MA. Yes, these three automakers submitted prototypes with Bantam's "Pilot" winning the bid, but all would go on to produce a version that would soon be standardized to conform to the much-improved Willys MB (which had significant input from all three manufacturers), with a Willys-sourced powertrain and production housed at their Toledo, Ohio plant (yes, where Jeep continues to build the Wrangler). Interestingly, Jeep's trademark pressed-metal grille was initially designed by Ford for their "Pygmy" prototype, but let's not remind the current crop of blue-oval designers or they'll lay claim on it before adapting it to their next generation of copycat Range Rovers. To most consumers Jeep is that iconic 4x4 brand that seems to have been around forever. It epitomizes rough and ready off-roading, that thought immediately conjuring up images of one of its many models trailblazing through a thickly wooded forest, trudging knee deep through marshland, fording a fast moving river, or spewing sand from oversized tires as it speeds up and over a dune, there's really no substitute for Jeep when it comes to serious 4x4s.